Life Time Achievement award sponsored by Lucid Colloids Ltd., Mumbai, Since 2003, Kolkata. ACCT(I) Life Time Achievement Award carries a cash reward of Rs.50000.00 , citation with memento. Excellence in Carbohydrate Research (up to 55 years) sponsored by Sunita Hydrocolloids Pvt., Ltd, Jodhpur, since 2010, Shimla. 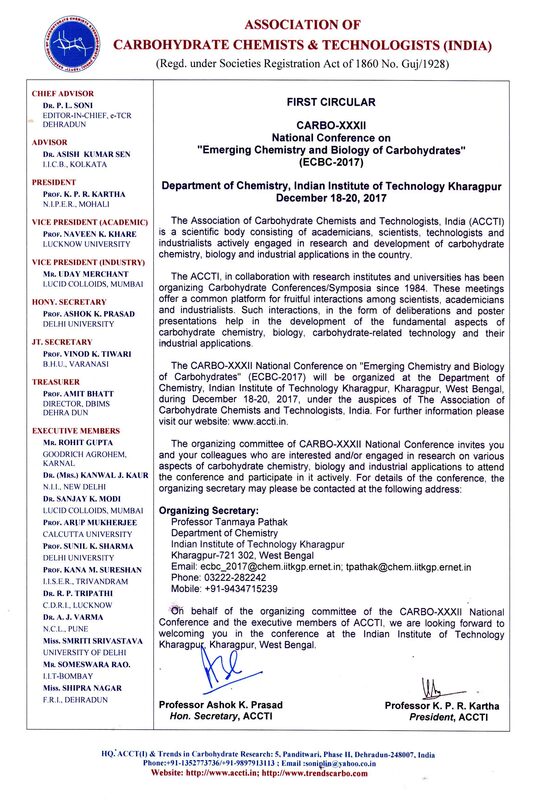 The Association of Carbohydrate Chemists & Technologies invites application for “Excellence in Carbohydrate Research” award-2012 which was initiated in 2010 at Silver Jubilee conference at HP University, Shimla. Best Paper published in TCR (Annually) sponsored by ACCT(I) Since 2010, Shimla. e-TCR Award for best paper published in Trends in Carbohydrate Research journal (www.trendscarbo.com) goes to Prof. Darren Grice of Griffith University, Australia for his paper entitled. G.C. Merchant Memorial Lecture sponsored by Lucid Colloids Ltd., Mumbai Since 2010, Shimla. UICT, Mumbai. The award carries a cash areward of Rs. 20000.00 along with certificate and travelling expenses. ACCTI announces a new award “Dr. H.C. Srivastava Memorial Award – 2012” upto the age of 40, which has been formulated at the Silver Jubilee CARBO XXV meeting of ACCTI at Shimla. Lyned Dafney Lasrado was conferred the “Young Scientist” Award on 13th November 2010 , at the 25th Carbohydrate Conference held at the Himachal Pradesh University, Shimla. 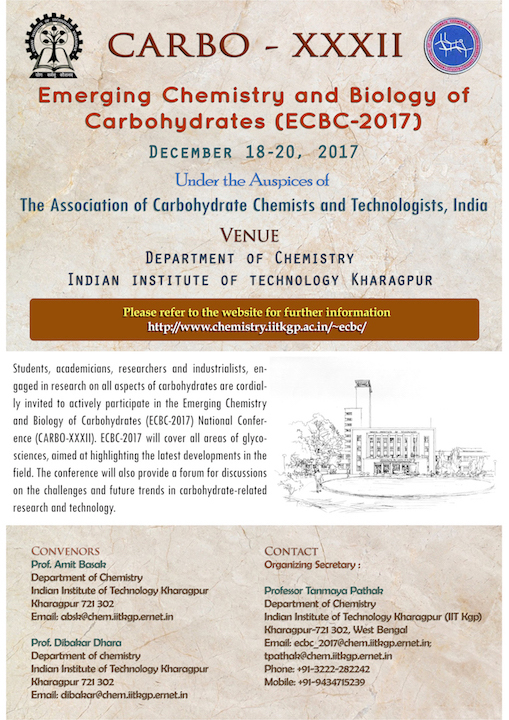 The Association of Carbohydrate Chemists & Technologists (India) has introduced a new award for the best Ph. D. thesis from 2014. 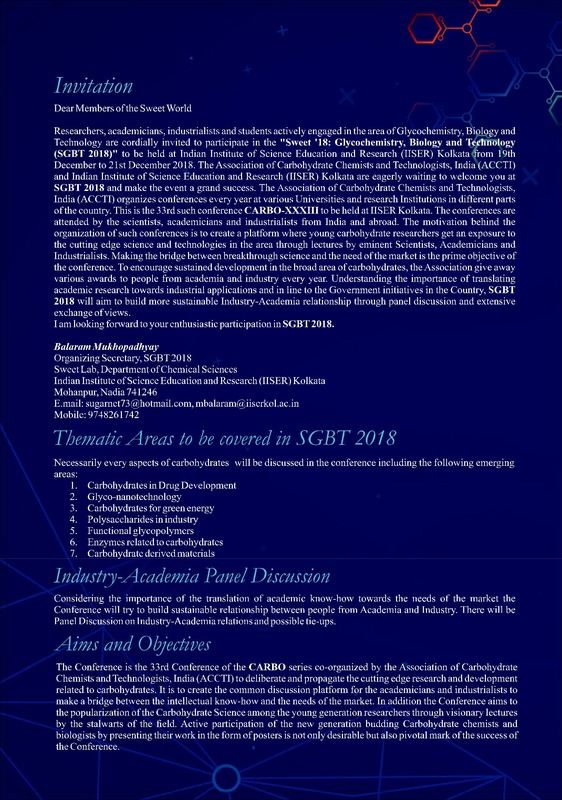 An International Journal on Investigation, Application & Technology. Application form for ACCTI Best Thesis Award. Norms for organizing carbohydrate conference.